Journey into an explosion of sight, sound, song and superb storytelling as brilliantly conceived by animation innovator Ralph Bakshi (FRITZ THE CAT, THE LORD OF THE RINGS, WIZARDS). 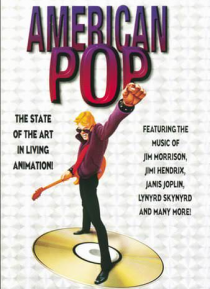 From a turn-of-the-century immigrant vaudevillian to a rock superstar, AMERICAN POP is the story of four generations whose lives revolve around the beat of American popular music. Featuring a mind-blowing soundtrack bu… rsting with the hit music of The Doors, Janis Joplin, Jimi Hendrix, The Mamas & The Papas, Lynyrd Skynyrd, Pat Benatar, Lou Reed, Bob Seger and more. Packed with energy, excitement, electricity and enthusiasm, Bashki's work is a ground-breaking, kaleidoscopic animated trip.